3. East side of Gayley Avenue, directly behind Ronald Reagan UCLA Medical Center. News vans may use these areas free of charge. If these areas are unavailable, news vans must check in at a campus parking kiosk for directions to a paid parking area. 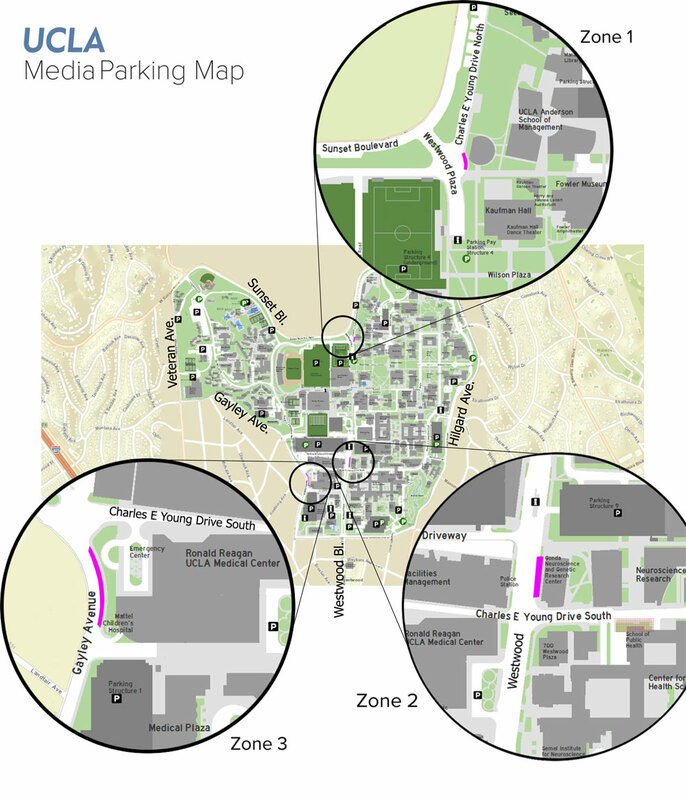 Note that there is no available news van parking within the campus proper. No parking is allowed in fire lanes. SUVs, sedans and other standard sized vehicles are not authorized for these areas. Vehicles parked next to red curbs or blocking a fire lane or fire hydrant are subject to ticketing and towing. Campus media relations personnel are unable to assist crews receiving tickets for unpaid or expired parking. For planned news events, parking instructions will be provided in advance. For unannounced news events, utilize the spaces listed above, check in at a kiosk or contact a communications officer to make parking arrangements. • General news stories: UCLA Media Relations, 310-825-2585. • Athletics stories: Athletics Communications, 310-206-7870. • Stories at the Ronald Reagan UCLA Medical Center and David Geffen School of Medicine: Health Sciences Media Relations, 310-794-0777.